About a decade ago my parents moved to the California High Desert, home to well known Joshua Tree National Park, and lesser known cities like Yucca Valley, 29 Palms, and Landers. I was immediately inspired by the landscapes of the desert, beautiful hikes, and quirky art installations. I wanted to purchase a plot of our own to create something special. First, we worked on a small cabin with my parents, then on a larger house to airbnb. I'm truly proud of these projects, but ever since we began, I’ve been itching to create something from scratch, a blank slate. After a year of patiently looking for the right land at the right price, we found a 5 acre property in Landers, CA. Landers in home to the Integratron, Landers Brew Co., Gubler Orchid Farms and Giant Rock. It's a short 20min to Joshua Tree National Park Entrance. The first step was finding an architect. I hunted around and found The Hundred Mile House on Houzz. I love Duane Smith's style, a sort of desert mid century modern combination with rustic appeal. Here is my initial mood board for the project. It's the first time my husband and I have ever worked with an architect. We were both nervous and excited to see the first 3 initial ideas sketched out. 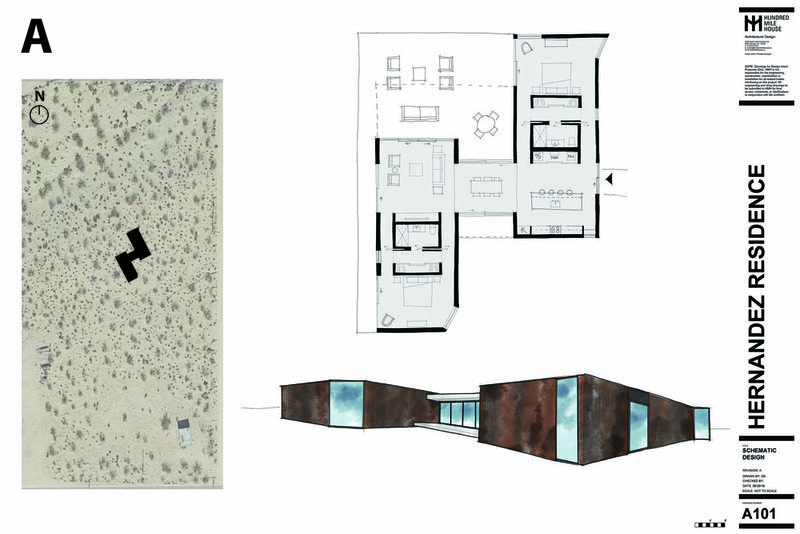 We visited Duane’s home in Palm Springs to view the initial sketches, and his home was so beautiful I was reassured we had made the right decision. We initially wanted a unique layout, 1 bedroom, 1 bath, with a large living room and deck, fire pit, AC, heat, and kitchen island. After some consideration and budget analysis we decided to add a bedroom and bathroom. We went with #3. I love how all the windows face outward to the back patio, and the unique way the two guest wings asymmetrically attach to the main living space. The guest wings are also two story with a view out to the desert from a higher elevation. After a few rounds, we landed on this layout. Over the course we made some modifications to the layout to reduce some of the square footage. The first modification we made was to remove the 3rd bathroom to shrink square footage in the living area. Then we made sure to add space for the washer and dryer, and reduced the guest wings which means that the stairs will now wrap, kind of loft style. We also removed some of the windows so we don’t have to reinforce the structure as much. This was all to save on cost and materials. We looked at 3 exterior options, wood, burned wood, and corten steel. I love all these options, but went with corten for it’s durability in the desert and rustic appeal. Now we’ll go into more steps like structural engineering, permits, and bids. It’s going to be a long journey, but one I’m really excited about! Once we start building there will be so many decisions to be made about lighting, tiling, fixtures, and interior decor. Can’t wait to share it with you! Landers Project will be Launching October 2019! This is the perfect blend of activities to get a taste of the desert vibe. A little relaxation, some hiking, great food and sight-seeing. Landers is a city not many people have heard of, but it’s Joshua Tree’s neighbor of the north. Here are 5 fun things to do in this little town that’s only a 20min drive from Joshua Tree National Park entrance. Key's View is the best drive-up vista in Joshua Tree National Park. From the top you can see the Coachella Valley and the San Andreas Fault. Just two hours from Los Angeles, there is little desert town near Joshua Tree that looks frozen in the 19th century. Pioneertown, a western movie set, was founded in 1946 by a group of Hollywood investors, including actors Roy Rogers and Gene Autry. This is quite literally a giant rock in the desert. According to most sources it's the largest freestanding boulder in the world at about 7 stories high. Integratron is a quirky and cute destination near Joshua Tree National Park in Landers, California. It's said to be situated on a powerful vortex of energy. Book a rejuvenating sound bath (meditation) far in advance, and hang out on the site at Hammock Village. Desert Christ Park is a museum of sculptures located on the hillside of Yucca Valley. There are more than 40 large white biblical statues here sculpted by Frank Antone Martin. For the last 15 years of his life, Noah created ten acres full of art installations in the desert. Everything is constructed from junked objects and materials.